Women in booze Wednesday: An interview with Hope on Hopkins artisan distiller. WOMEN WEDNESDAY: Supporting women in South Africa and abroad by buying and engaging in women-run, owned, operated, and staffed businesses. Begin by turning your average Wednesday into a conscious effort to support women and highlight female entrepreneurs and leaders. 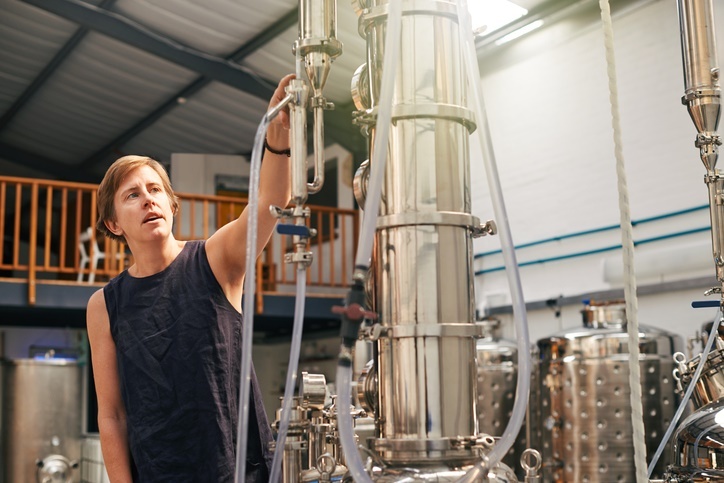 Lucy Beard is the co-founder of Hope on Hopkins, a Cape Town gin distillery that prides itself on crafting spirits from scratch. Lucy and partner, Leigh Lisk, left their day jobs as lawyers and created one of South Africa's premium local spirit brands. Playful and sometimes pink, Beard brews beautiful botanical gins and spirits with the legendary Mildred and Maude (plus newcomer Mouma). A leader in the artisanal alcohol industry, Lucy Beard is positively representing what it means to be dedicated to one's craft. Gin is the most creative of the spirits: it’s more like being a chef where you get to play with flavours. All the female small business owners in Cape Town. There are so many young women doing such amazing things, particularly in the creative space here in Cape Town, and they are truly inspirational. Have you faced any challenges or successes that have been a result of being a woman in a male-dominated spirits industry? There is a certain side to the spirits industry that is slightly sleazy and incredibly male-dominated. It was a challenge initially, particularly in being taken seriously in this industry. Tell us about a defining moment in your life that made you proud, as a woman, to be a distiller and business owner. The proudest moment in this business so far was seeing the first bottle of our gin on a shelf, it went to The Gin Bar behind Honest Cafe in Cape Town, and we had the first drink from it. I still can’t quite believe we’d got there after all the struggles along the way! What’s up next for Hope on Hopkins? The gin scene continues to grow and we’re now making gins for six other brands as well as for Hope, but we’re also growing our spirits portfolio. We’ve just released our Esperanza Reposado: an agave spirit (we’re not allowed to call it tequila as it’s not made in Mexico) that has been aged for four months and we’re also aiming to distil some whisky to put away to age later this year. Tips for being a master mixologist at home? My favourite way to drink gin is in a martini, you do need to have a beautifully smooth gin though. Many people are put off by martinis, as they are quite strong (they are essentially neat gin), but served ice cold with a splash of vermouth they are the most delicious thing ever! My favourite is the real classic Martini: you stir 50ml of our London Dry Gin, with a teaspoon of vermouth over lots of ice, then strain into a chilled Martini glass and serve with a twist of lemon zest: delicious! Otherwise, a G&T is always a good way to go, just ensure that you don’t drown your gin in tonic. My recommendation is a 4:1 ratio and to use the Ginventory app to find the perfect garnish to go with the gin you’re drinking. Happy Women's Day! Perfect excuse for a #gin cocktail ? ?